Solar cell technology has improved dramatically over the past couple of year, yet it will be a long time before multi-junction cells – then kind that can reach efficiency well over 40% – will become affordable to small home owners or even large scale installation. New methods are always explored, however, each with its own angle to harnessing solar energy, benefits and disadvantages included. One of the biggest challenges to improving solar cell efficiency is collecting light frequencies that are outside the visible spectrum, and a new technique developed at Caltech makes use of a most interesting physical effect: plasmon resonance on the surface of metal nanoparticles. Credit: AMOLF/Tremani – Figure: Artist impression of the plasmo-electric effect. 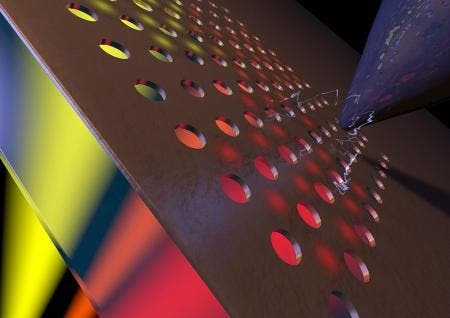 The researchers report an all-metal geometry that they used to convert optical power to an electrical potential. The potential is too small to become useful for generating power – not yet at least – but the team believes even at its current state of development it could be used in new types of sensors. At their core, solar cells function by exploiting a basic principle called the photovoltaic effect, first discovered by French physicist A. E. Becquerel in 1839. As photons hit a silicon surface – the defacto material of choice for solar cells – the outermost electrons in the atoms get excited until they reach an energy level that lets them jump free from the silicon. The electron then jumps from silicon atom to silicon atom, leaving what’s called a “hole” behind. It’s this electron-hole pair that allows solar cells to harness energy and transform it into electricity, once the electrons eventually reach a metal contact and complete a circuit. The problem with conventional solar cells is that only frequencies from the visible spectrum are being absorbed. Infrared light, which is also the most energy intensive, can’t be absorb and thus passes right through and becomes lost as heat. In fact, this heat further causes problems because the increased temperature affects efficiency in an unwanted way. “The silicon absorbs only a certain fraction of the spectrum, and it’s transparent to the rest. If I put a photovoltaic module on my roof, the silicon absorbs that portion of the spectrum, and some of that light gets converted into power. But the rest of it ends up just heating up my roof,” says Harry A. Atwater, the Howard Hughes Professor of Applied Physics and Materials Science, who led the study. Atwater and colleagues have now found a way to harness these infrared frequencies using a structure made not of silicon, but entirely out of metal! The all metal structure was chosen to make full use of a fascinating phenomenon called plasmon resonance. Plasmons are coordinated waves, or ripples, of electrons that exist on the surfaces of metals at the point where the metal meets the air. The plasmon resonance is usually used in biotherapeutic and drug discovery research, as well as protein activity and stability analysis in biopharmaceutical production, but recently the effect has been probed for solar cell research as well. In their natural state, metals have a predetermined plasmon resonance. When the same metals are arranged into various nanostructures, however, these resonances can be tuned to other frequencies. With this in mind, Atwater and colleagues placed gold nanoparticles on an indium-tin-oxide substrate and arrays of 100-nm-diameter holes in 20-nm-thick gold films on a glass substrate. Negative and positive surface potentials were registered during monochromatic irradiation at wavelengths below or above the plasmon resonance respectively. These potentials were as large as 100 mV under 100 mW/cm^2 illumination. This electrostatic potential is a first step in the creation of electricity, Atwater says. “If we can develop a way to produce a steady-state current, this could potentially be a power source”. The idea is to use the plasmoelectric effect in tandem with traditional silicon solar cells, so that both visible and infrared light are harnessed. It might be a while before we see anything like this demonstrated. For now, the phenomenon could be exploited to make new types of sensors that detect light based on the electrostatic potential, according to the paper published in Science.